ons chipped into the rock over thousands of years. In the late afternoon you'll arrive at your camp in the heart of the protected area, where there'll be time to relax and take in the sunset before enjoying a Bedouin feast of meat and vegetables cooked in the zerb, an oven of fire-heated sand and stone. If you're still not tired out by the day's adventures you can stay up round the fire, talking with your Bedouin hosts and watching the night sky. By the time you wake up to the desert silence your guides will already have the kettle on the fire. We'll share an early breakfast and head off in the jeeps for a short drive to Burda rock bridge, one of Rum's most impressive geological formations. You'll follow your guide up across the warm sandstone, using your hands but never having to really climb. From a small plateau we drop into a hidden gulley and get a wonderful first view of the bridge above us. The next section is a short rock wall where your guide will use a rope to make sure you get up safely. From here you'll walk out onto the bridge (1360m) and take in views across the whole of Wadi Rum. You'll descend via a different route, crossing open slabs of sandstone and scrambling down a steep groove back to the desert floor. After the three-hour round trip we'll find a shady spot to rest and eat together. After lunch, followed by a cup of tea and a siesta, you'll head off again by jeep towards the red dunes. On the way there's a chance to see one of Rum's oldest works of rock art, a depiction of a camel caravan crossing the desert. When you reach the dune you can kick off your shoes and run down the soft, warm sand. 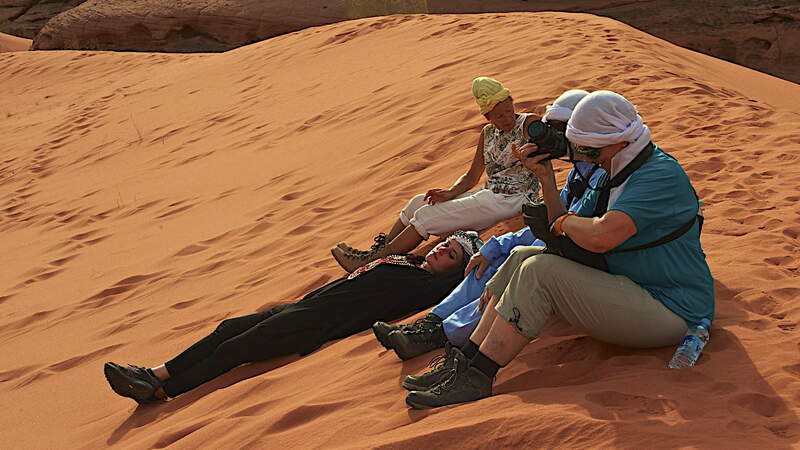 Every guide to Wadi Rum repeats the description written by T.E. Lawrence of Arabia almost century ago, and with good reason. "The Arab armies would have been lost in the length and breadth of it," he wrote, "and within the walls a squadron of aeroplanes could have wheeled in formation. Our little caravan grew self-conscious, and fell dead quiet, afraid and ashamed to flaunt its smallness in the presence of such stupendous hills. Landscapes, in childhood's dream, were so vast and silent."